The Coast Guard Cutter Boutwell was scheduled to return to San Diego Thursday from a two-month Eastern Pacific patrol during which it thwarted a significant drug smuggling attempt. The 378-foot vessel and its crew of about 160 apprehended three suspected drug smugglers and seized 1,375 pounds of drugs headed north toward Central America on Dec. 30, according to the USCG’s public affairs office. 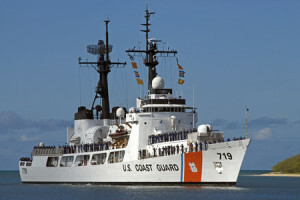 U.S. Coast Guard Cutter Boutwell. Coast Guard photo. The Boutwell also performed three search-and-rescue missions involving stranded fisherman during its latest patrol. The vessel was named for former U.S. Secretary of Treasury George S. Boutwell, a one-time abolitionist who served under President Ulysses S. Grant. Boutwell was also the 20th governor of Massachusetts, and a senator and representative from that state. As a senator, Boutwell sponsored the Civil Rights Act of 1875, which guaranteed equal treatment in public accommodations. Though signed by Grant, the act was later ultimately deemed unconstitutional by the Supreme Court.